who get extraordinary things done. They are the men and women from all over the globe, from all walks of life and of all ages, and from a variety of organizations, public and private, government and NGOs, high-tech and low-tech, small and large, schools and professional services, who daily struggle to lead us to greatness. They're not the public figures, the famous people, or the mega-stars. They're the people who might live next door or work in the next cubicle over. We've focused our 25 years research and writing on everyday leaders because leadership is not about position or title. Leadership is not about organizational power or authority. It's not about celebrity or wealth. It's not about the family you are born into. It's not about being a CEO, president, general, or prime minister. Leadership is about relationships, about credibility, and about what you do. If you're a manager in an organization, to your direct reports you are the most important leader in your organization. You are more likely than any other leader to influence their desire to stay or leave, the trajectory of their careers, their ethical behavior, their ability to perform at their best, their drive to wow customers, their satisfaction with their jobs, and their motivation to share the organization's vision and values. If you're a parent, teacher, coach, or community leader, you are the person who's setting the leadership example for young people. It's not hip-hop artists, movie stars, or professional athletes they seek guidance from. You are the one they are most likely going to look to for the example of how a leader responds to competitive situations, handles crises, deals with loss, or resolves ethical dilemmas. It's not someone else. It's you. I used to think leaders had to be at the top level of a large organization. With that view of leadership, the chasm between where I am and being a leader was uncrossable. Now, I see leaders leading a group of people of any size and leading at any level. You are a leader if you employ these five leadership practices because people around you want to follow. In that sense, I feel that I'm already a leader. There's no escape. Leadership is everyone's business. No matter what your position is, you have to take responsibility for the quality of leadership your constituents get. You—and that means all of us—are accountable for the leadership you demonstrate. And, because you are the most important leader to those closest to you, the only choice you really have is whether or not to be the best leader you can be. The notion that leadership is reserved for only a very few of us is reinforced every time someone asks, "Are leaders born or made?" Whenever we're asked this question—which is almost every time we give a speech or conduct a class or workshop—our answer, always offered with a smile, is this: "Yes, of course, all leaders are born. We've never met a leader who wasn't. So are all accountants, artists, athletes, parents, zoologists, you name it." We're all born. What we do with what we have before we die is up to us. It's just pure myth that only a lucky few can ever understand the intricacies of leadership. Leadership is not a gene, and it's not a secret code that can't be deciphered by ordinary people. The truth is that leadership is an observable set of skills and abilities that are useful whether one is in the executive suite or on the front line, on Wall Street, Beijing Financial Street, or Main Street, in any campus, community, or corporation. And any skill can be strengthened, honed, and enhanced, given the motivation and desire, along with practice and feedback, role models, and coaching. We've been fortunate to have heard and read the stories of thousands of ordinary people who've led others to get extraordinary things done. And there are millions more. It's not the absence of leadership potential that inhibits the development of more leaders; it's the persistence of the myth that leadership can't be learned. This haunting myth is a far more powerful deterrent to leadership development than is the nature of the person or the basics of the leadership process. The experience of Juan Gonzalez is typical of the leaders we've worked with around the world. Juan told us that taking the view that leadership was a set of practices was a good start for understanding that leadership was everyone's business, and this approach offered him a new perspective on the world of human interaction by demystifying the notion of natural born leaders and, if anything. The fact that leaders can learn to be leaders though self-awareness and effort opens the possibility that individuals have a choice about pursuing or ignoring the calling of leadership. Not everyone will be a leader of historical proportions; however, we all can and should assume leadership roles in our regular activities more often than not. Certainly, we shouldn't mislead people into believing that they can attain unrealistic goals. However, neither should we assume that only a few would ever attain excellence in leadership (or in any other human endeavor). We do know that those who are most successful at bringing out the best in others are those who set achievable "stretch” goals and believe that they have the ability to develop the talents of others. We know that effective leaders are constantly learning. They see all experiences as learning experiences, not just those sessions in a formal classroom or workshop. They're constantly looking for ways to improve themselves and their organizations. Even if some people think that they're not able to learn to lead, you must believe that you and they can. That's where it all starts—with your own belief in yourself and in others. I want to accomplish almost any objective I set for myself by being credible with all the people in my life. 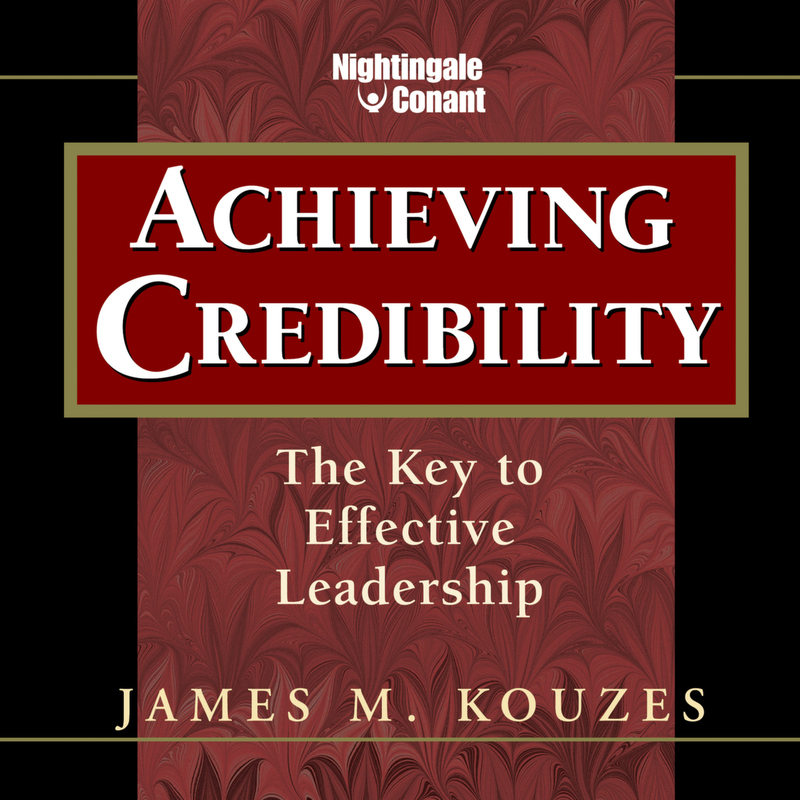 Achieving Credibility at the special price below. — I can select one of two ways of ordering.